Our brown boxes are as boring as possible! Your privacy is extremely important to us and our discreet packaging enables you to shop with Lovehoney in complete confidence. Our website is filled with thousands of products to get you excited, but don't expect the same from our packaging. We make sure there's nothing exciting about our plain brown and boring boxes. All Lovehoney orders are packaged and wrapped so as to prevent anyone guessing what's inside the parcel or who it's from. Sometimes the requirements of the country your order is dispatched to means Customs and Regulations may require details of your order on the outside of your packaging. We also have to apply a customs label to your parcel. For discretion, we state that it contains Novelty Items. Additional information added by the courier is beyond our control. Will the package have return to sender details? Australia Post requires us to have a return address on all packages. Because we know how nosy people can be, we get all our packages returned to this is what is shown on your packaging. This is how we discreetly and securely package all of our Lovehoney orders. We package larger items in our custom-made sturdy, plain brown boxes. We have two sizes of boxes to cope with larger toys and board games. We also throw in loads of tissue paper to ensure the items don't rattle around. 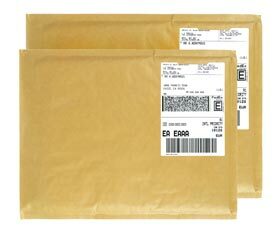 We package smaller items such as condoms in heavy-duty grey envelopes. 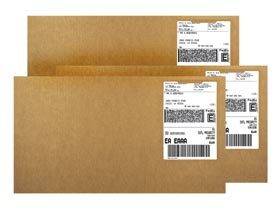 All our boxes and envelopes are also double-wrapped with heavy-duty packing tape. There are no markings on the back or side of your package. 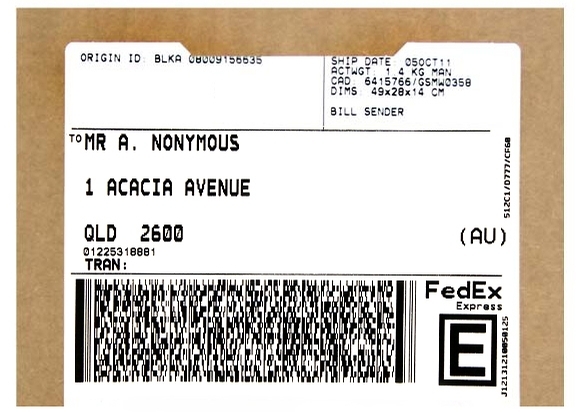 The only markings are your address label on the front (just like the one below) and sometimes a courier sticker, depending on the service used for your designated country.